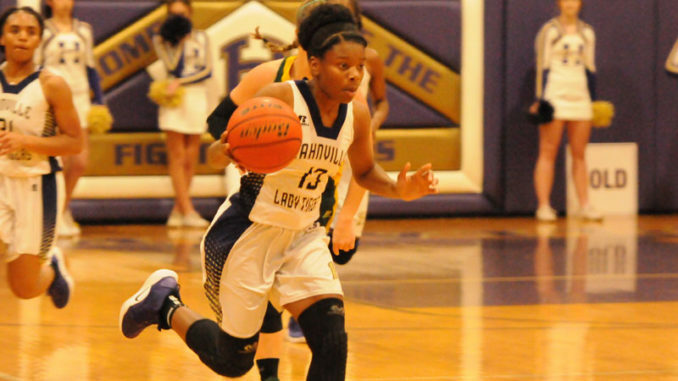 Kori Joseph and her Hahnville teammates have been rolling through district play. The Hahnville Lady Tigers have caught fire. Hahnville’s decisive 63-39 win over Destrehan Friday night at R.K. Smith Middle School was the Tigers seventh consecutive win, with HHS now sitting at a record of 18-11 overall and 8-1 in District 7-5A. The Tigers have not lost a game since the calendar flipped to 2019, and a district championship could very well be in the cards for the first time in years. HHS leads both Thibodaux and H.L. Bourgeois by a game. The Tigers travel to Thibodaux Tuesday for a key showdown. Chardeidra Madison led the Tigers with a team-high 22 points against Destrehan, helping HHS build a 33-17 halftime lead it didn’t look back from. Paceley Williams scored 12 and Danae Lorio added 11. Korrianna Reynaud led Destrehan (16-14, 1-7) with a game-high 27 points on a night the Wildcats were missing a number of key players. Madison said the Tigers’ teamwork has led to their late-season surge. Among the most pivotal wins was a recent 48-40 victory at H.L. Bourgeois, which bested Hahnville at Hahnville early in district play. “That was such a big win for us. We knew we had to come in ready and we were able to get the win,” Martin said. Madison said she and her teammates have made it a point to take something from their losses—though of late, there haven’t been many. “You have to learn from each one. It can be more about your losses than your wins when it comes to getting better, and it took us understanding that,” she said.